Home Office Digital is changing the way the Home Office works, building new digital services that help keep the UK's streets safe and its borders secure. We work in small Agile delivery teams, putting the user at the heart of everything we do. We’re now recruiting for a number of roles for our new Sheffield Development Hub, to help shape the culture and direction of the department. We’re looking for talented, enthusiastic and collaborative people who are passionate about transforming digital public services. If that sounds like you, send your CV, clearly stating which role you are applying for, to hodigitalsheffield@digital.homeoffice.gov.uk to be invited to a recruitment day where you can find out more about our current opportunities. The closing date for applications is 31 December 2015. At Home Office Digital we do things differently. We've introduced an Agile culture to the department, building digital services to help it make better decisions faster in borders, immigration, citizenship, policing and security. We research, design and build our services in-house, using small, multi-disciplinary teams. With the support of the Government Digital Service, this is an entirely new direction for government and a fantastic opportunity to positively influence how we do things at the Home Office. We're continually innovating and iterating to make our business processes smarter. And we’re now investing in the specialist skills we need to build our digital capability even further. Read more about working at Home Office Digital. Successful candidates with exceptional skills and experience may be paid at the top end of the salary scale and may also receive a recruitment and retention allowance up to a maximum of up to £1,500. Home Office Digital is building a development team in Sheffield, and wants business analysts who are looking to challenge themselves and build their skills. You'll join a team where you'll be working with other skilled and motivated people, with a culture that promotes openness, participation and ownership. You'll need to maintain a keen awareness of technology as well as Home Office policy and processes. You'll work closely with the business and will play a key role in communicating key principles such as user centred design, Agile delivery and quality management. Successful candidates with exceptional skills and experience may be paid at the top end of the salary scale and may also receive a recruitment and retention allowance up to a maximum of up to £2,250. Successful candidates with exceptional skills and experience may be paid at the top end of the salary scale and may also receive a recruitment and retention allowance up to a maximum of up to £3,500. Our content designers work in fast-paced delivery teams to create clear, user-led content for digital services.They work closely with user researchers and designers to challenge assumptions and test ideas, writing content which meets user needs as clearly and quickly as possible. Successful candidates with exceptional skills and experience may be paid at the top end of the salary scale and may also receive a recruitment and retention allowance up to a maximum of up to £4,000. Successful candidates with exceptional skills and experience may be paid at the top end of the salary scale and may also receive a recruitment and retention allowance up to a maximum of up to £1,750. Our delivery managers work in small, focused teams, delivering quality user experience-led solutions for our customers. We are truly Agile and this is reflected in the co-location of our product owners with the delivery teams, our small iterative releases, modern development techniques and our culture of openness, participation and ownership. Successful candidates with exceptional skills and experience may be paid at the top end of the salary scale and may also receive a recruitment and retention allowance up to a maximum of up to £2,500. As a designer you’ll be responsible for designing services so good that people prefer to use them. Our designers work closely with user researchers, developers and the product team to design services focused on user needs. They work by prototyping and iterating: testing ideas quickly with real users and using prototypes to learn, moving to working with code as early as possible. We don’t produce documentation purely for sign-off, and we don’t throw wireframes ‘over the wall’. Work ranges from sketches, through to HTML prototypes, workshops, and participating in user research. This role is about challenging assumptions, testing ideas, meeting user needs and testing how well those needs have been met. You’ll need experience of agile delivery and of forming close partnerships within digital service teams. You’ll ideally have a degree in a design related subject, an interest in design history and the possibilities of the web, and an understanding of how form and function work together. You’ll proactively seek new learning opportunities and welcome constructive criticism of your work. You’ll need experience of agile delivery and of forming close partnerships within digital service teams. You’ll ideally have a degree in a design related subject, an interest in design history and possibilities of the web, and an understanding of how form and function work together. You’ll proactively seek new learning opportunities and welcome constructive criticism of your work. Successful candidates with exceptional skills and experience may be paid at the top end of the salary scale and may also receive a recruitment and retention allowance up to a maximum of up to £3,000. Home Office Digital is building a development team in Sheffield. We want really talented developers who have started their career and are looking for the next step to challenge themselves and build their skills. You'll join a team where you'll be working with other skilled and motivated people, with a culture that promotes openness, participation and ownership. The concept of Dev Ops has been enthusiastically adopted by Home Office Digital across its delivery estate. The growing development hub in Sheffield will require people who can support the development and delivery environments. We are looking for people who truly are 'Dev Ops' and can comfortably span development and operations. Successful candidates with exceptional skills and experience may be paid at the top end of the salary scale and may also receive a recruitment and retention allowance up to a maximum of up to £4,333. Home Office Digital works across the breadth of Home Office delivery, from passports to police, and visas to borders. This is an ideal opportunity for an experienced Technical Lead to join a team that embraces a start up culture but is also building core digital products and services that will have a positive impact on millions of people. You won't be an ‘ivory tower’ architect, but will relish working closely with the developers and other members of the technical community to deliver user focused solutions for the Home Office. Home Office Digital is building a Development Hub in Sheffield. The vision is for a team capable of supporting development from initial conversation, through development and into production. This team will become a permanent feature in Sheffield for the Home Office and will need administrative support to ensure the successful delivery and support of great Digital products and services for the Home Office. This is a great opportunity to join a growing team that will impact the lives of many people. We need someone who can work with very little direction and is adept at ensuring the office runs smoothly. We need someone who can work with very little direction to set up and manage the processes needed for the hub to operate efficiently and accountably. Great products don't make themselves. We're looking for someone who can provide the vision and direction the operations and development teams require. You'll be someone who understands the intersection between technology, business requirements and the user experience. You'll use this knowledge to devise a product strategy for the Home Office in Sheffield and encourage the continuous and iterative improvement of key products. We're looking for talented, passionate service designers to join our expanding team in Sheffield. As a service designer you are responsible for designing services so good people prefer to use them. 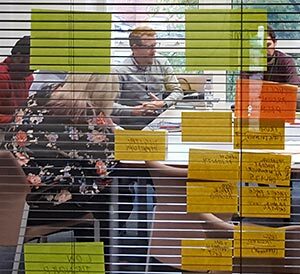 Our service designers work closely with user researchers, interaction designers, developers and the product team to design services focused on user needs. This role is about challenging assumptions, testing ideas and translating user needs into a solution that meets those needs – and then to test how well those needs have been met. You will be comfortable considering the wider journey, how it fits together and the systems that underpin it. Service design is a new discipline in the Home Office, and through your work you will develop services that demonstrate what excellent service design and service delivery looks like. That will include designing services that are efficient, cost effective, usable and satisfying. You’ll share your learnings with the wider design and research community (both within Home Office Digital and wider Government) and help promote service design and communicate the value it delivers. You should have experience of agile digital delivery, be comfortable with deploying service design within agile, and of forming close partnerships within digital service teams. All development at the Sheffield Development Hub will be conducted using Agile delivery methods. Therefore we're looking for people with substantial experience of working in and with self-starting Agile delivery teams. You’ll need a good understanding and solid experience of enterprise development, testing, deployment, configuration, troubleshooting and enterprise platforms. Successful candidates with exceptional skills and experience may be paid at the top end of the salary scale and may also receive a recruitment and retention allowance up to a maximum of up to £2,000. Our user researchers work within fast-paced delivery teams. They form close partnerships with designers, front-end developers and business analysts. They don’t spend time writing lengthy reports, but look for engaging ways to communicate findings to delivery teams and stakeholders across the department. Ideally you’ll have a degree in HCI, usability, cognitive psychology, market research or a related field.